What are soft disposable contact lenses? Soft disposable contact lenses are made of soft, flexible plastics that allow oxygen to pass through to the cornea. Soft contact lenses may be easier to adjust to and are more comfortable than rigid gas permeable lenses. Newer soft lens materials include silicone-hydrogels to provide more oxygen to your eye while you wear your lenses. It is common to feel some slight irritation when wearing contact lenses for the first time. The eye gradually adjusts to this discomfort by decreasing its sensitivity over the course of around ten days. Because of this, it is best to gradually increase the time spent wearing contact lenses. It is also sensible to aim for a day off after the first five days while you are acclimatising to contact lens use. Start with four hours per day and increase this by one hour per day. An inside-out lens – remove the lens and turn it the right way around. Residual debris on the lens – remove the lens and clean thoroughly before putting it back in. If these two steps do not fix the irritation, remove your contact lenses and make an appointment to see your optometrist. How do they correct vision? A soft lens can correct short sightedness (myopia), far sightedness (hyperopia) and astigmatism where both near and far vision can be blurred. Because the lens rests right on your eye, they tend to provide much better side vision and clearer vision overall. Also if there is a difference in prescription between your eyes, that effect is minimised in contact lenses. How long will soft disposable contact lenses last? Disposable contact lenses are available in daily, two-weekly and monthly designs, and are to be replaced at these intervals. Overwear of contact lenses can lead to irritation or infection, whereas brand new contacts give your eyes a feeling of refreshment – just like putting on clean clothes. Replace your contact lenses as recommended by your optometrist to reduce the risk of discomfort. Many people find they are most comfortable if they limit lens use to 8-10 hours per day. The maximum lens wearing time varies between people, but it may be possible to wear a lens for 12-14 hours per day. How do I insert my lenses? 1) Wash hands and dry them with a towel. 2) Place the contact lens on the tip of your index finger (which should be no wetter than your eye or the contact lens) and tuck your other fingers out of the way. 4) Place the contact lens on the iris (coloured part of your eye) with the bottom edge of the contact lens touching first. 5) Press firmly and then release your eyelids. 6) Gently massage the contact lens into place through the lids or blink a few times. 7) Once your lenses are in place, wipe their case with multi-purpose solution and leave it to air-dry. You should replace the case every three months. How do I remove my lenses? 2) Drag your bottom eyelid down with your middle finger. At the same time, gently pull your top eyelid upwards with your middle finger and ring finger. 3) Pinch the contact lens off the eye, without squeezing it too hard, with your thumb and index finger. 4) Clean and store the first contact lens before removing the second. ALWAYS use the prescribed cleaning solution, which serves as a cleanser and disinfectant. It also increases the comfort of your contact lenses. NEVER use saliva, saline or water of any type. Tap, distilled and bottled water (and particularly saliva) contain bacteria and viruses, which may be absorbed by the contact lens and cause eye infections. It is important to clean your soft contact lenses daily to maintain the highest standards of comfort and visual clarity. Each day after you remove your lenses, you must clean them prior to overnight storage. 3) Use only the contact lens case provided to store your contacts. 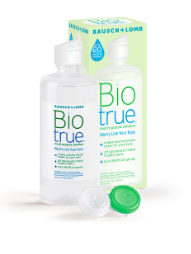 Fill the cases with BioTrue liquid. Be sure to place the left contact lens into the left holder, and the right contact lens into the right holder. Always use fresh solution when storing your lenses. Never “top off” or use old solution. Bacteria can accumulate in contact lens cases. After putting in your contact lenses, the case should always be emptied and air-dried. A new contact lens cases is included with every purchase of contact lens cleaning solution. Always throw away the old case and use the new one. The case should only be filled halfway with solution (if over-filled, the lens may ride up and be damaged by the lid). The use of the contact lenses past these dates is NOT recommended, as the lenses are not structurally or functionally designed to last any longer. The material often breaks down after this date, causing irritation and poor vision. Make it easier to remember by changing your lenses on the same day each month or fortnight. If you only wear lenses occasionally, it is best to use daily disposable contact lenses. Very few contact lenses are designed to be worn during sleep (and those which are will have been specially prescribed). Wearing contact lenses during sleep is associated with an increased risk of infection. There is also a risk that the lens may get stuck on the eye after waking. Do not attempt to move the contact if it is stuck. If you wait for about an hour after waking, your normal tear flow will help to lift the lens very slowly from its resting position. It can also help to rinse your eyes with lubricant drops or your contact lens solution, as this will help to lift the lens. The safest option for waters sports is to wear daily disposable contact lenses and goggles. Water contains germs, which may be absorbed by the contact lens. Wearing your contact lenses after these activities would be the same as wearing your wet swimsuit for the next fortnight or month. In the event you get water splashed in your eyes, make sure to remove your lenses and clean them thoroughly. The humidity in aircraft cabins is very low. If you wear your contact lenses they will become very dry and uncomfortable and you will arrive at your destination with sore eyes. Please wear your spectacles for flying. If you want to swim in your lenses then you must make sure to use goggles and then disinfect the lens thoroughly afterwards. It is not recommended to swim in fresh water even if it’s flowing freely due to the risk of infection from Acanthamoeba, which can cause severe loss of vision. All soft contact lenses absorb water within the lens. When you swim in fresh water or use tap water with your contact lenses it is able to get into the contact lens and replace the sterile water that is there. This means that Acanthamoeba could be living in your contact lens multiplying ready to cause an eye infection. In the above scenario, if you remove the lens but your eye is still hurting. it is likely that there is something wrong with your eye. That means it would be best to come and see us straight away to have it checked. Can the lens get lost behind my eye? The lens is caught under the upper lid – look downwards and towards your nose and massage your upper lid to dislodge the contact lens. The lens is actually still in place – you can check for this by covering your other eye; if your vision is still good, the lens is still in place. You have removed the lens, but it has fallen on the floor or on your clothing – repeated attempts to remove the lens will just cause irritation to your eye. We normally like to see you about 1- 4 weeks after picking up your lenses and then again at 3 months, 6 months and at least every 12 months thereafter. This is so we can review the health of your eyes and suggest any improvements in your contact lens prescription, lens design or material. Your contact lens prescription is only valid for 12 months so we need to see you to renew it. Always wear your lenses to your contact lens appointments, having had them in for at least 2 hours. Please bring your contact lens case and spectacles with you. Daily disposable contact lenses are $199 for 90 pairs (3 months supply). Fortnightly lenses are $120 for 3 months supply. Monthly lenses from $90 for 3 months supply. Custom made lenses, soft custom $750. If a lens is damaged when the patient opens the blister, then we can order a spare one for free. No warranty is available on loss of a contact lens. We can give a 100% refund on soft contact lenses if the box is undamaged and unopened. We do not give refunds for opened/ used contacts. Please note we do not give refunds on fitting fees. Please see our office policy or speak to your optometrist for further details.